Students use a variety of equipment inside the Kremer Innovation Center to create project prototypes and parts for competition teams. A new engineering design and laboratory building – the Kremer Innovation Center – is providing opportunities for Rose-Hulman students to enhance their hands-on, collaborative educational experiences. Fabrication equipment, 3D printers, wind tunnels and dimensional analysis tools available in the KIC are within easy reach of students working on competition teams, capstone design projects and in mechanical engineering classrooms. The 13,800-square-foot Richard J. and Shirley J. Kremer Innovation Center that opened at the start of the 2018-19 winter academic quarter and was dedicated April 3. It was named to honor the couple’s philanthropy to the institute. Richard Kremer, a 1958 chemical engineering alumnus, went on to start FutureX Industries Inc., a manufacturing company in Bloomingdale, Indiana, that specializes in custom plastic extrusion. The company has grown over the course of the past 42 years to become a leading supplier of plastic sheet materials to transportation, printing, and manufacturing industries. Located on the east side of campus, adjacent to the Branam Innovation Center, the facility has expanded and enhanced opportunities for innovation and experimentation. The KIC offers equipment that students are using to create device prototypes for a variety of projects. A CNC router in the Fabrication Lab (dubbed “Fab Lab”) cuts large sections of foam and wood to create cross sections of vehicles for racing teams. A water jet machine, wood cutting equipment and new tabletop CNC router shape metal, thick plastic, wood and glass into useful parts of all shapes and sizes. Several new 3D printers will soon allow students to take their designs from the drawing board (or computer screen) to fabrication and then prototype stage – the early stage in the production cycle of any engineering project, notes Bill Kline, associate dean of innovation and professor of engineering management. The building also has a new Thermofluids Laboratory, known as the Wet Lab, with a water channel and other equipment that allows mechanical engineering professors to build dimensional analysis experiences into their fluids classes, which are being taught in the adjacent classrooms. Other classes utilizing the educational spaces are covering such topics as theoretical aerodynamics, introduction to design, propulsion systems, fatigue analysis and combustion. In the middle of the KIC is a maker lab, where students tinker and develop creative ideas. In addition, open workspaces and a conference room are in use throughout the day and night by a variety of competition teams collaborating across disciplines. 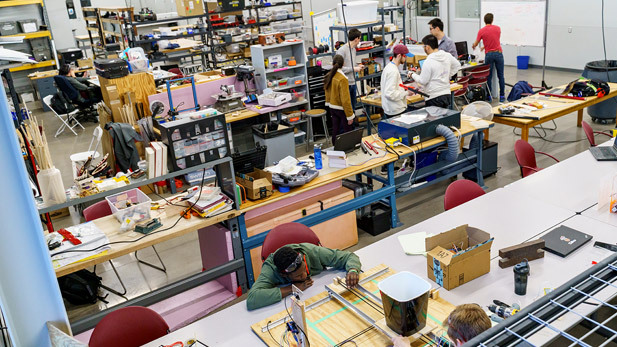 A design studio is being added for the 2019-20 school year to support students majoring in engineering design, a new program added to the 2018 curriculum.